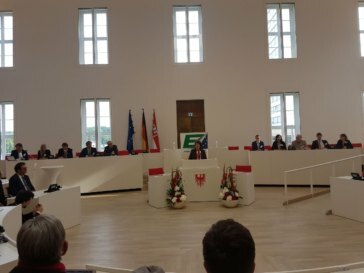 The project “TruLies – The Truth about Lies on Europe” was present at the Europa-Union Deutschland’s citizens’ dialogs in both Bremen and Potsdam as part of the series “Und jetzt, Europa? Wir müssen reden!” (“And now, Europe? We’ve got to talk!”). At the dialog series’ kickoff event in Bremen on 16 March 2017, “Europe’s Role in the World: Values, Influence, Self-Conception” and “The Single Market and Free Trade: Does Europe need Cooperation or Isolation” were the predominate themes of discussion. During the debate the fact that many people were less than convinced about the European Union was recognized. However, in the meantime many had taken notice of the importance of Europe and commitment to Europe is becoming clearer. In addition, the importance of engaging in discussions right now on the future shape of the EU and to pursue the question as to a European identity and improved conveyance of European values and achievements was highlighted. The third event in the dialog series took place in Potsdam on 15 June 2017. This time the main talking points were “Europe’s Role in the World: Foreign Policy, Security, Migration” and “Economy and Social Policy: Work, the Single Market, Consumer and Social Standards”. Again, the importance of debating the future of the EU was emphasized in the context of the EU’s current crises. The European Commission’s White Paper on the future of the EU was said to be a step in the right direction. The scenarios presented in the White Paper could form a framework for these debates. Additionally, it was noted that the EU’s successes could be more effectively communicated. It would be necessary to always consider in which areas a common European solution was more sensible and what issues would better be dealt with at the national or regional level. The necessity for active societal engagement was also underlined. The discussions at the citizens’ dialogs have shown how important a fact-based debate with citizens is for a successful future of the EU. The project “TruLies” aims at fostering and launching exactly such a debate.